Looking for that hard to find gift idea? 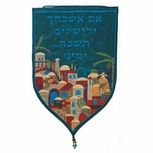 Then check out the Wall Hanging Judaica items. 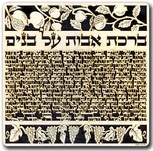 Our Wall Hanging Judaica is truly unique because of the techniques, materials and designs. We also stock an extended range of Scripture Wall Hangings at our sister store in Jerusalem. 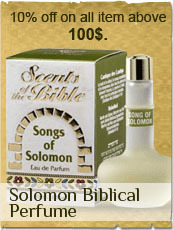 Fast shipping direct from the Holy Land. 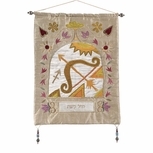 Handmade Wall Hanging Judaica, in modern colorful designs. They are a great gift for a housewarming party, or wedding present. All these designs are hand made by Israeli best designers. 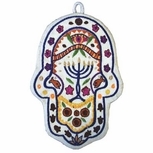 Hamsa Hand Judaica wall hanging collection. Find here a beautiful Hamsa to your home. Wheter you prefer glass, silver, wood or ceramic, we have it all. Special designed by Israeli top artists. Jewish Prayer Decorations original paintings full of vibrant colors. Hand made out off wood, glass, sterling silver or ceramic. All these items are made in Israel. Wall Hanging Home Blessings. It is our goal that we ground your home in love, that we bless your home in whatever manner is most comforting for you. Feel free to pick out the home blessing which will fit you most. Wall Hanging with Zodiac symbols. Wall Hanging art is a simple and effective way to change the atmosphere within your house. All these handmade wall hanging pieces are made by Israeli artists.